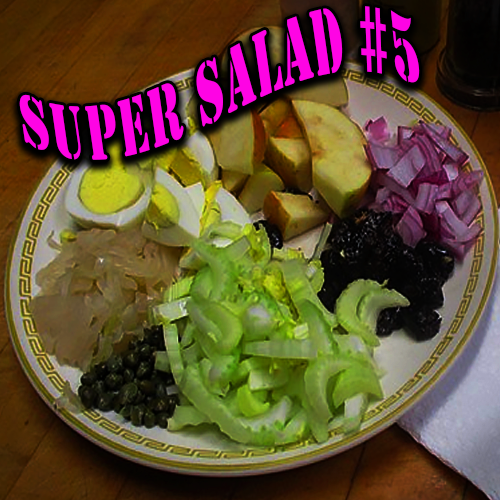 Super Salad #5 for Bodies of Steel. For Stamina and Healthy Digestion Eat a Good Salad. hips, head, face and neck. 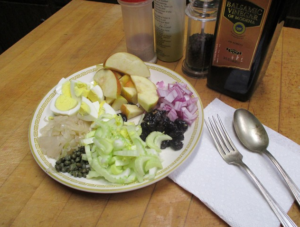 The sauerkraut, capers, and onions will provide natural ingredients your body needs for maintenance and The eggs, black olives and apples will supply sugars and fats to see you through active hours. Two boiled eggs. Just boiled enough to make them solid. A heaping tablespoon of capers. A small fist of red onions. A small handful of dried black olives. Half of a large apple—preferably with the skin still on. A hand-full of raw sauerkraut—with its probiotics still intact. Salt, pepper, olive oil, balsamic vinegar are optional. Use whatever flavorings and seasonings that you like. This hearty salad is a delight—especially during hot weather. It will travel well, especially if the eggs are left in the shells. (Not really necessary). Carry things, like a can of good tuna fish, Kosher hot dogs and a little whiskey (I didn’t say that) separately. Experiment and have fun. Don’t let food be a harsh enemy. Food is Your Friend. Trust and Respect What You find. Turn this wimpy little salad into a powerful meal by adding bacon, ham, red meat, fish … use your imagination.